Well before winning the full rights and privileges of citizenship, women trained in the law fought alongside social reformers for legal protections encompassing women and children’s issues. One key element in this fight, providing equal access to legal representation whether or not the client could afford it, seemed a radical idea in 1886 when a Hull House resident named Florence Kelley helped form the Protective Agency for Women and Children. Sponsored by the socially active Chicago Women’s Club, of which Jane Addams was a leader, the Protective Agency for Women and Children provided legal assistance primarily for young girls working in the factory sweatshops and for abused women fleeing their husbands. Additionally, Addams and other Protective Agency committee members were instrumental in the creation of the Illinois Juvenile Court Law of 1899, which established the first juvenile court in the country. 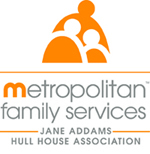 When in 1919 the Legal Aid Society became part of United Charities (now called Metropolitan Family Services) as the Legal Aid Bureau, it continued to focus on working women’s economic issues, even as it and expanded to other areas of importance to Addams, including housing, workers’ compensation, and immigrants’ rights.